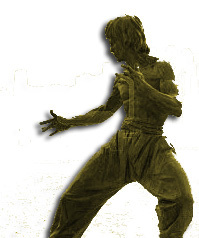 While I want to talk about Bruce Lee’s idea of which side to have forward in a fight, I don’t want to discuss his personal lead or stance. He had variables, like one side being an inch shorter than the other, that I don’t want to include in this discussion. Okay? Bruce Lee shocked the world when he said that you should practice predominantly favoring one side as a your response stance. In other words, he favored one lead. He said that you should lead with your strong side. What did he really mean by that? Bruce was contrasting his advice with that of a boxer’s. Boxers feel that you should keep your strong side back, in reserve. You test, fake, and feint with your weaker side forward, and then when you find that opening (with a combination or a fake … or just good timing), you follow up with your strong-side, fight-ending blow. This is why in boxing, a left-handed person would fight with the right side forward. And that should be your guideline: Let’s say that you had to hit a machine to determine your punch power. And you only get one chance to punch. Which side would you punch with? Now, let’s say you had to retreat, and as someone kicked at you, you had to stop it with your best, low-line stop kick? Which foot would you want to kick with for perfect timing? And finally, if a one-armed fighter were attacking you, and you had to deal with this person with only one hand, which hand would you want to engage with, and which wouldn’t you mind putting behind your back? If you keep coming up with the same side …. the side that is fastest, the side that’s most coordinated, the side that delivers the most power … then that should be your lead side. How soon should you show your lead? When should you affect a neutral stance with neither side forward? Should you change your lead if your opponent changes his? How wide of a stance should you take?